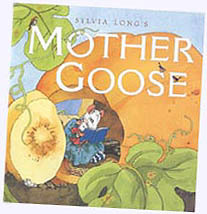 Sylvia Long's Mother Goose: From bestselling artist Sylvia Long comes an enchanting collection of over seventy-five classic Mother Goose rhymes. Imbued with the artist's love of nature and overflowing with charming details, this spectacular compilation includes such timeless favorites as Old Mother Hubbard, Mary had a little lamb, and Rock-a-bye baby. Sylvia Long's Mother Goose is a perfect gift that, like the rhymes themselves, will be passed from one generation to the next. Hardcover Picture Book. All Ages. The Real Mother Goose: For more than seventy-five years The Real Mother Goose has been delighting millions of children, and today the magic is as strong as ever. Men and women who loved this book in childhood are now sharing it with their children and grandchildren. 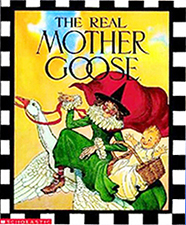 Teachers and librarians acclaim it as the "standard" Mother Goose. All the familiar verses are here, exactly as they have been repeated from generation to generation. Blanche Fisher Wright's lively, colorful pictures -- more than one hundred sixty of them -- make an enchanting introduction for the very young. Hardcover, All ages. 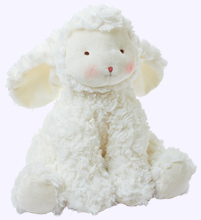 Mary's Little Lamb: This 8" developmental toy character is full of activity - with a squeaker, rattle, crinkle sounds and soft fabric textures for babies and toddlers to discover. Dragon Activity Toy: Engage inquisitive minds and hands at play. Dragon has wing pockets with four attached toys (two egg squeakers, a prince and a castle rattle). 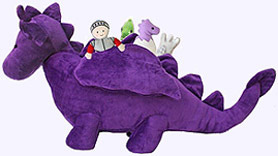 Children will enjoy enchanting fantasy fun with this dragon in soft purple velour with stitched eys. Dragon is 24" long. On the Night You Were Born Polar Bear Plush Doll: On the night you were born, Polar Bears danced. 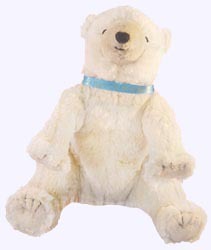 Polar Bear Plush Doll is 10" tall and is a great stuffed doll for read alongs. On the Night You Were Born: On the night you were born, the whole world came alive with thanksgiving. The moon stayed up till morning. The geese flew home to celeberate. Polar bears danced. 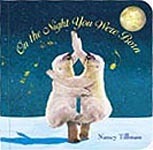 On the Night You Were Born Board Book: On the night you were born, you brought wonder and magic to the world. The moon stayed up till morning. Polar bears danced. Here is a book that celebrates you. Board book includes interactive text for reading to a child. Board Book. Ages 2 & up. 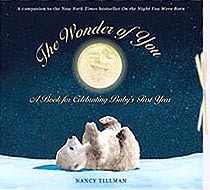 The Wonder of You "Baby's First Year": Nancy Tillman, author and illustrator of On the Night You Were Born, has created an exquisite baby book that builds on each and every sentiment from her picture book, especially "You are the one and only ever you." Milestones can be celebrated and remembered here, from details of baby's arrival to the first tooth, first steps, first playmates, and first birthday. With a charming growth chart and ample room for photos and other mementos, The Wonder of You is an elegant keepsake for every new family. A yellow bow, to match the embossed title, keeps all items neatly inside. Included is a beautiful 5" x 7" You are loved print for framing! Baby Bear, Baby Bear, What Do You See? 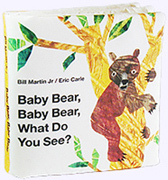 A special cloth book edition of the much-loved Baby Bear, Baby Bear, What Do You See? This soft-to-touch cloth book for babies and young toddlers features a selection of the native American animals from the original Baby Bear tale using Eric Carle's trademark illustrations, as well as a carefully edited version of the story for very young readers. Cloth book is 7' x7" and has deeply-padded pages and a soft carry handle to encourage tactile exploration. 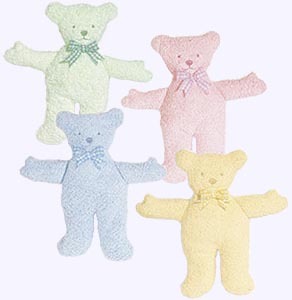 Baby Bear Plush: Small and cuddley, these plush bears are perfect companions for the stories of Bears on Chairs, Bears in Bed, and Bears in the Bath. 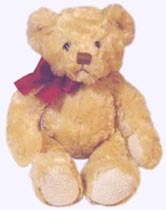 5 1/2" Bears make a crinkle sound when squeezed by a child. 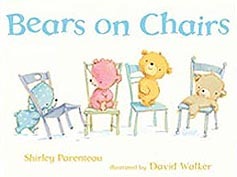 They are made from soft ultra-suede velboa, baby safe and machine washable..
Bears on Chairs: Four adorable bears sit on four chairs, but when Big Brown Bear shows up, they must put their heads together to make room for one more, in a cozy tale filled with infectious rhymes and expressive illustrations. Hardcover Picture Book. Ages 2 - 5. Peter Rabbit Gift Set: This Beatrix Potter Gift Package features the original Tale of Peter Rabbit with re-originated illustrations. The watercolors are reproduced more accurately than ever before, including six illustrations that were omitted from the original printing because of space limitations, two of which have never been used before. The hardcover book (4 1/4" by 5 3/4") is truly a treasure. 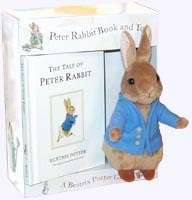 A 6" plush Peter Rabbit is dressed in his blue jacket and holds a carrot taken from Mr. McGregor's garden. 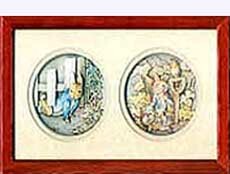 Beatrix Potter Framed Cameos: Three-dimensional de'coupage figures of Beatrix Potter's Peter Rabbit characters. Beautifully framed in lacquered wood shadow boxes. Created at the John Ellam Studios in England. Double Cameos are 6.25" x 9".Single Cameo is 5.25" x 5.25". Peter Rabbit First Curl and First Tooth Set: This set of ceramic boxes helps parents store precious moments of childhood: their first curl, and first baby tooth. 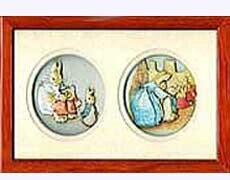 Each box is decorated with designs from original Beatrix Poatter illustrations and measures approximately 2" long and 1" high. The set is packaged in a closed gift box. 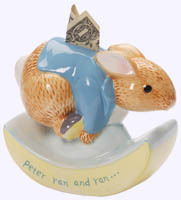 Classic Peter Rabbit Bank: This ceramic rocking bank features Peter Rabbit in a running pose with the message "Peter Ran and Ran and Ran." Bank is 5.7" in length and is packaged in a closed gift box. 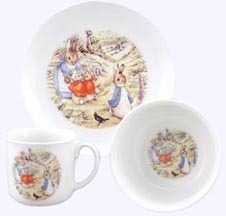 Peter Rabbit in Garden Porcelain Breakfast Set: Porcelain Breakfast Set made in Germany features Peter Rabbit in the garden along with Mrs. Rabbit, Flopsy, Mopsy and Cottontail. Set contains 7' dish, 5" bowl and cup. Set is attractively boxed for gift giving. Animal Crackers: Jane Dyer's eloquently illustrated collection of Mother Goose rhymes, lullabies, and poems for a child's first years. Hardcover. Ages Birth - 5. 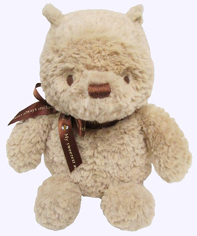 Little Plush Bear: A special Little Bear with a big bow around his neck. 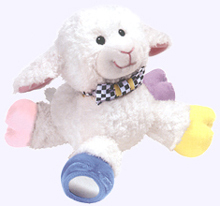 Much like the older style Teddy Bears, he is brave and can be adventurous at times. 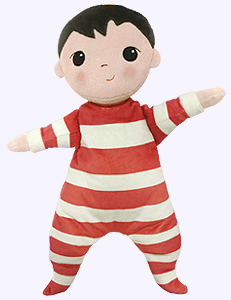 He is 9.5" tall and he loves to cuddle up with children and listen to Teddy Bear stories. Little Bear is surface washable and safe for all ages. Box of Animal Crackers: Three Animal Crackers board books in a carry along boxed set: Bedtime, Nursery Rhymes, and Animal Friends. 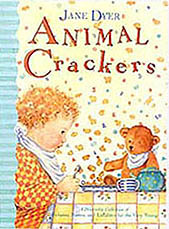 Animal Crackers Card: Illustrated by Jane Dyer. Inside: Hope your Birthday spells big fun! 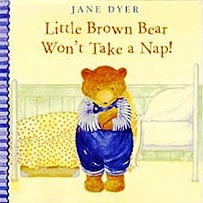 Little Brown Bear Won't Take a Nap! While the rest of his family sleeps through the winter, Little Brown Bear decides that he would rather do something fun and so heads down south with the geese to play on the beach in the warm sun. But eventually he finds that he misses his nice bed at home. 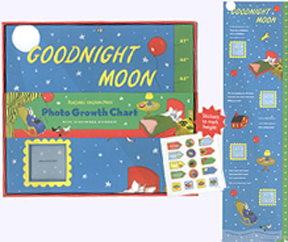 Goodnight Moon Photo Growth Chart: Make every inch a special event with the art and story from this timeless classic children's book. This sturdy keepsake growth chart is the perfect addition to any nursery or young child's room. A unique gift that children and parents will enjoy for years! 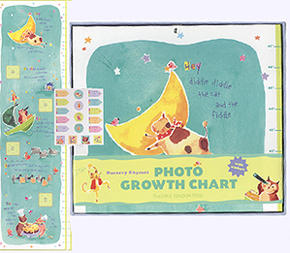 Growth chart includes 16 storybook stickers to mark height and 4 built-in frames for photos. Growth chart measures child to 47". Nursery Rhymes Photo Growth Chart: Children will love keeping track of their height with their favorite nursery rhymes, each charmingly illustrated. Parents will love the growth chart's decorative, keepsake quality. Growth chart includes Colorful Stickers to mark height and 4 Built-in frames for Photos. A unique gift that children and parents will enjoy for years. Chart measures child's height to 47 inches. 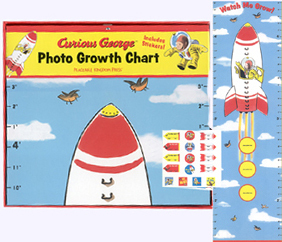 Curious George Photo Growth Chart: Watch you child shoot up with Curious George and his rocket. A great choice for a baby shower or a child's first birthday. Parents will love this unique growth chart, which includes stickers to mark height and 3 built-in frames for photos. Chart measures child's height to 53". Because You Are My Baby: This precious story illustrates that the love a mother feels for her child is not unlike the affection animal mothers in the desert show their offspring. 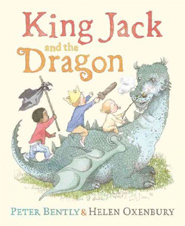 Beautifully written text is lovingly complemented by Sylvia Long's wonderful illustrations, making this an important book for parents and children to share together. 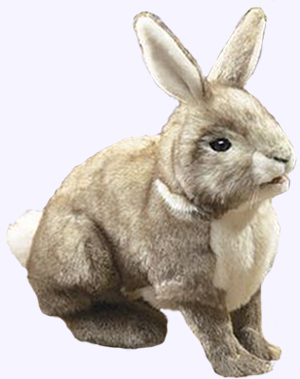 Cottontail Rabbit Puppet: This adorable storytime pal is super soft. It sits alert with ears perked. The front paws and mouth are moveable in this life-like rabbit. Hand Puppet. 14" long. 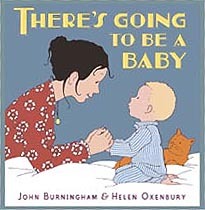 There's Going to be a Baby: When is the baby coming? What will we call it? What will the baby do? We don't really need the baby do we? John Burningham's timeless story, perfectly complemented by Helen Oxenbury's illustrations, follows the swirl of questions in the mind of a young child anticipating a baby sibling with excitement, curiosity, and just a bit of trepidation. Hardcover Picture Book. Ages 2 and up. 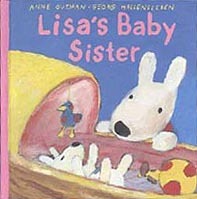 Lisa's Baby Sister: Lisa is jealous of the attention her new baby sister Lila is getting until someone proclaims that the cute baby looks just like Lisa, then Lisa becomes the proud big sister and even takes Lila to school for show-and-tell. Hardcover Picture Book. Ages 2 - 4. Hush Little Baby Board Book: In this enchanting version of the beloved lullaby, award-winning artist Sylvia Long has drawn upon her favorite childhood bedtime memories as well as memories of reading and singing with her own children to create a classic board book sure to be treasured for generations to come. Ages 1 & up. 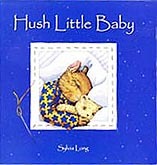 Hush Little Baby: From award-winning artist Sylvia Long comes a touching version of the well-known lullaby, Hush Little Baby. 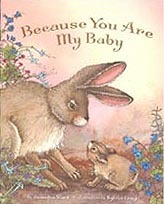 Each spread reveals a tender scene as a mama bunny lulls her baby bunny to sleep by enlisting a parade of bedtime wondersthe beauty of a hummingbird in flight; the magic of a harvest moon; the reassurance of a parent's hug, all these and more combine to create a classic volume sure to be treasured for generations to come. Hardcover Picture Book. Audience - Babies, Ages 0 - 2. 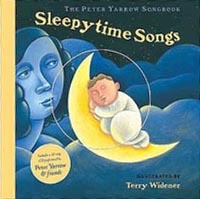 Hardcover Picture Song Book with CD.